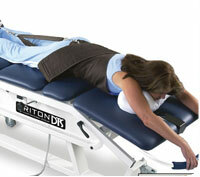 Spinal decompression is a non-invasive, non-surgical treatment for certain types of chronic back pain. Mechanical spinal decompression works by slowly and gently stretching the spine, thereby taking relieving pressure from compressed discs and vertebrae. The Chiroworks team considers spinal decompression therapy to be one of the most exciting medical treatments developed in several years; it demonstrates strong statistical results for long-term pain relief. Herniated discs are the most common spinal conditions treated with decompression treatment. Concisely, significant spinal compression can cause disc herniations to expand, which applies unwanted pressure to the surrounding spinal nerve roots. Decompression treatment takes the pressure off these damaged discs, which has the effect of causing the disc bulge to shrink down closer to its original size. Degenerative disc disease is also a common condition that can be treated with decompression therapy. A loss of disc height can be occasioned or exacerbated by spinal compression, which causes the vertebral bodies to move closer together. This process can cause nerve compression and result in other forms of common back pain. Decompression therapy eliminates the overwhelming pressure applied to degenerated discs, thereby reducing or eliminating painful symptoms. Facet joint syndrome is yet another condition treated with spinal decompression. Of all the conditions, this one shows the least promising results for permanent pain relief. Conceptually, facet syndrome causes pain due to arthritic changes in the vertebral bones. Decompression helps to create more space between the vertebrae, hopefully reducing painful symptoms.